You can configure an Aurora Serverless DB cluster when you restore a provisioned DB cluster snapshot with the AWS Management Console, the AWS CLI, or the RDS API. For general information about restoring a DB cluster from a snapshot, see Restoring from a DB Cluster Snapshot. You can restore a DB cluster snapshot to an Aurora DB cluster with the AWS Management Console. In the upper-right corner of the AWS Management Console, choose the AWS Region that hosts your source DB cluster. In the navigation pane, choose Snapshots, and choose the DB cluster snapshot that you want to restore. On the Restore DB Cluster page, choose Serverless for Capacity type. In the DB cluster identifier field, type the name for your restored DB cluster, and complete the other fields. To connect to an Aurora Serverless DB cluster, use the database endpoint. 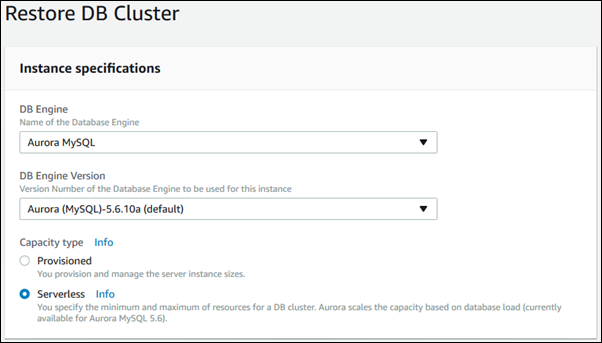 For details, see the instructions in Connecting to an Amazon Aurora DB Cluster. Unable to create the resource. Verify that you have permission to create service linked role. Otherwise wait and try again later. For more information, see Using Service-Linked Roles for Amazon RDS. To configure an Aurora Serverless DB cluster when you restore from a DB cluster using the AWS CLI, run the restore-db-cluster-from-snapshot AWS CLI command and specify serverless for the --engine-mode option. You can optionally specify the --scaling-configuration option to configure the minimum capacity, maximum capacity, and automatic pause when there are no connections. Valid capacity values are 2, 4, 8, 16, 32, 64, 128, and 256. In the following example, you restore from a previously created DB cluster snapshot named mydbclustersnapshot. You restore to a new DB cluster named mynewdbcluster. To restore the DB cluster as an Aurora Serverless DB cluster, set the --engine-mode option to serverless. The example also specifies values for the --scaling-configuration option. To configure an Aurora Serverless DB cluster when you restore from a DB cluster using the RDS API, run the RestoreDBClusterFromSnapshot action and specify serverless for the EngineMode parameter. You can optionally specify the ScalingConfiguration parameter to configure the minimum capacity, maximum capacity, and automatic pause when there are no connections. Valid capacity values are 2, 4, 8, 16, 32, 64, 128, and 256.